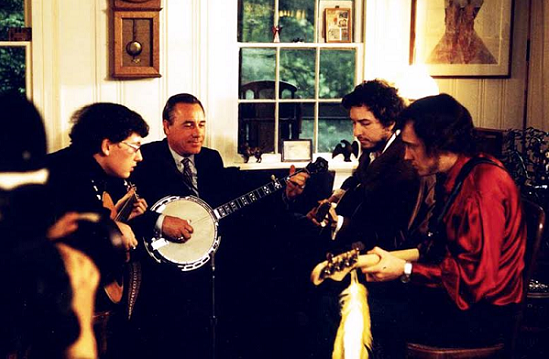 Earl Scruggs and his sons playing with Bob Dylan. Host Frank Stasio talks about the life and legacy of Earl Scruggs with Gordon Castelnero, co-author of "Earl Scruggs: Banjo Icon". The new book “Earl Scruggs: Banjo Icon” (Rowman & Littlefield/2017) traces Scrugg’s story from his origins on a farm outside Shelby, North Carolina, to his rise as a bluegrass icon. Host Frank Stasio talks with the book’s co-author Gordon Castelnero. Castelnero reads Saturday, May 6 at the Earl Scruggs Center in Shelby, N.C at 2 p.m.